The Legal Genealogist‘s paternal grandfather was the youngest of what we now know were seven children born in Bad Köstritz in what is now the German state of Thüringen. Through paper trail research, I can confirm that these were the only seven children born to my great grandparents,8 and I can add a lot of detail to the lives of every one of these people, through their marriages, the military service of the two boys, the births of their children, in most cases their emigrations to the United States, and even their deaths, including one son in World War I. Lots of detail for every one of them. Every one of them, that is, except one. One of those seven children has only three entries in her life story. I hadn’t taken the time to really follow up on this one child, whose records after her baptism were so completely missing. 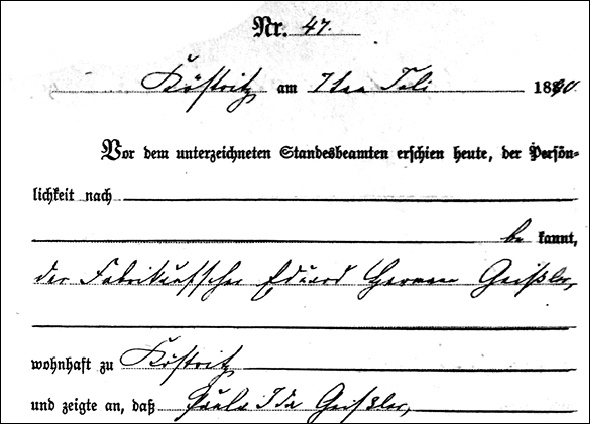 Until this week when I began to truly study the records of the civil registration office in Bad Köstritz. And made that last entry in the database. At 10 a.m. on the sixth of July 1890, at the home of her parents. Paula Ida, dead, just three months and 20 days old. It’s time to say farewell to this little girl lost in my family history. There will be no more records to be found. No photos of her childhood joys or pains. No records of her schooling or marriage. No children to be found and traced. Her story ended really before it was barely begun. Cite/link to this post: Judy G. Russell, “Farewell to Paula Ida,” The Legal Genealogist, posted 26 Jan 2019 (https://www.legalgenealogist.com/blog : accessed date). Sad. This brings back thoughts I had about my contribution to the world as compared to others. There is always the thought that no one will know I was here. Perhaps it’s a good motivator to do more. Your work in supporting the Mt Vernon Foundation and more will hardly be forgotten, Harold. You did wonderful work to honor her short life. I appreciate when family historians are able to find and memorialize these ‘twigs’ on our family tree, for their stories are important, too. Thanks for the kind words. I make it a special commitment to write up these twigs whenever I find them. They must not be forgotten. Just thinking about what her death meant to her older siblings — the oldest was nine when this baby died! She had to have been affected by that loss, too.